Among Oribe ware are numerous pieces of unique incense containers made in a variety of shapes and decorations. This piece, which is small yet excellently crafted, is boldly cut in the kikkō (tortoise shell) shape and attached with a handle. 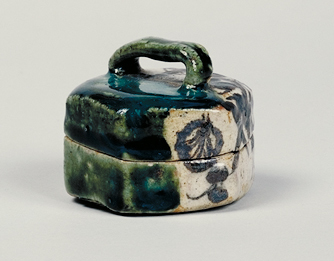 Half of the container is covered with a thick coat of green glaze, while the other half has a coat of white slip over which drawings of a bamboo fence and a viny plant bearing berries have been rendered in underglaze iron. The brushwork is strong and brilliant, displaying the excellent skill of the artist.